Are you interested in being out-of-the-box? Do you like geometric prints and vintage inspired accessories? 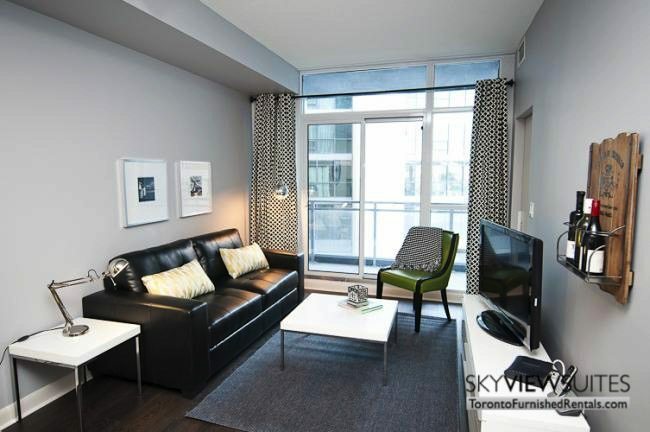 If yes than this 2 bedroom apartment may be just what you need for your Toronto furnished short term rental. 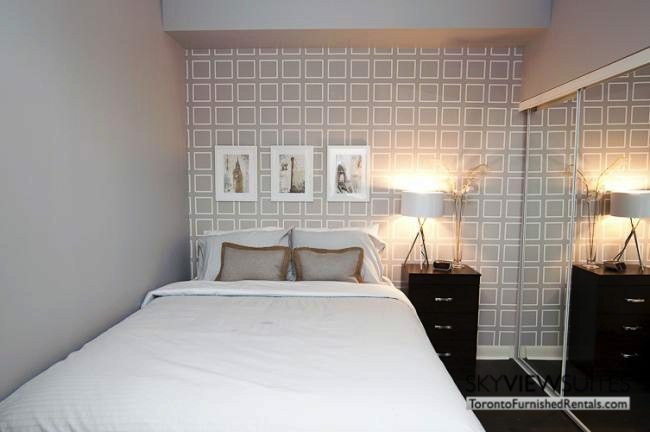 This modern two bedroom unit has high-quality finishes like brushed nickel hardware, granite countertops in the kitchen as well as a beautiful glass mosaic back splash. The stainless steel appliances are fully functional, and there is island seating for two. Adjacent to that is a dining area which seats four, the furniture included is stylish. It flows openly up to the living room and the look continues a comfortable chair and couch made of leather sit there. The television rests on a well-designed piece of furniture. The windows are flanked by boldly printed curtains, behind is the door to the balcony. Both bedrooms also employ some brave patterns, each have a queen sized bed and a full sized bathroom. There is also a desk available in the unit, good for any work or study related times, or it can be used as a separate make up station. A bonus of staying in a Toronto serviced apartment is that there is bi-weekly cleaning service; your sheets and towels are cleaned for you. And, if you wish to wash your own clothes you can do so since there’s an en-suite washer and dryer. What’s best about this suite is that it has floor to ceiling windows, 9 foot ceilings and engineered hardwood floors throughout. For entertainment, there is free wireless internet and cable TV in the suite. The structure itself has excellent amenities, including a fitness facility. 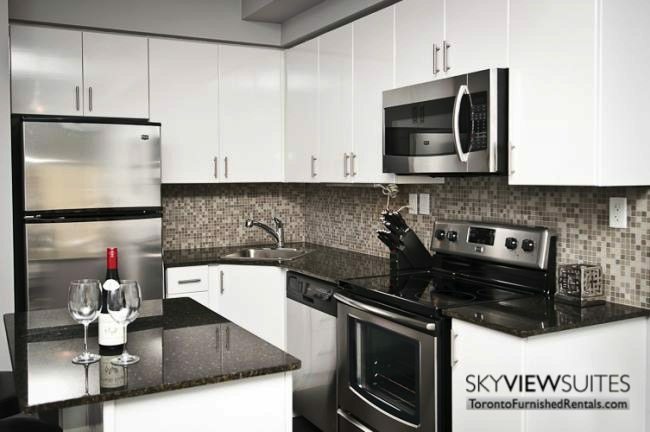 Only a little bit of steps from Toronto’s picturesque Harbour Front, this furnished suite at LTD condos puts forward convenience for any type of extended stay. The waterfront is merely minutes away, while famous Toronto landmarks like the CN Tower, Roger’s Center and the Air Canada Center are also within that reach. Just a few blocks north is Toronto’s chic King West district, which boasts quite a few of the best restaurants and nightlife in Toronto. A short drive east will put you into the core of Toronto’s financial district. Whether you’re into imbibing beer, or would rather slowly sip wine, King Street is where beverages are at. Some of the unsurpassed bars are bunched along this block. Bier Market is one of those bars; it carries over 100 brews of beer from more than 24 countries and also offers an assorted menu. Brant House is sited just off of King Street, on Brant, it is a hip bar that morphs into an after dinner dance club. An additional club in the neighbourhood is Century Room; it was a warehouse built in 1904 and recently restored. Historical features galore are at this building. These are just a handful of the available places on King, discover them yourself! The main streets surrounding King Street W are Queen Street W which runs parallel, Bathurst Street and Spadina Avenue which are adjacent. 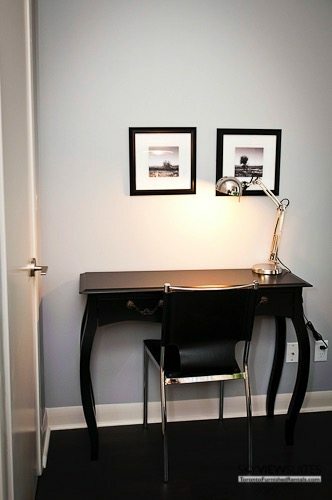 The greatest thing about renting out Toronto serviced apartments is that you get more benefits than staying at hotels. For example, there is way more space so you don’t have to be cramped up in four walls.